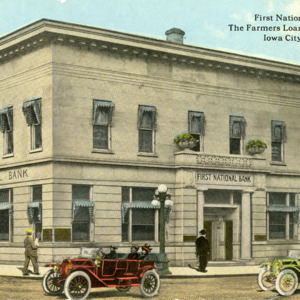 The First National Bank in Iowa City was located at 202 East Washington Street. 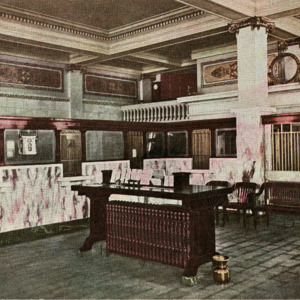 Lobby, First National Bank, Iowa City, Iowa. The Farmers Loan and Trust Co. 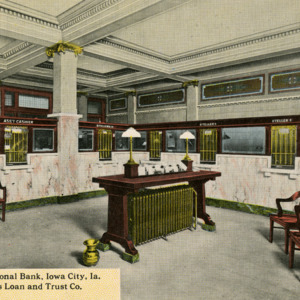 The First National Bank in Iowa City was located at 202 East Washington Street. Postcard sent from Harriet Martin Dey to George Van Steinberg, postmarked July 11, 1914. George Washington 1-cent stamp. "See the World on 'A.B.A.' Cheques"
American Bankers Travelers Cheques advertisement from First National Bank of Iowa City. 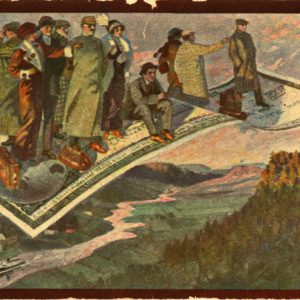 Postcard sent from T. Frank Hersch to A.E. Irmscher, postmarked March 12, 19??. George Washington 1-cent stamp.